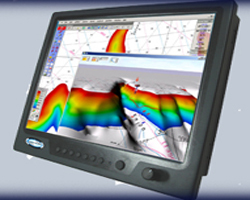 Fredrik Marine carries Marine PC’s professional marine grade fanless integrated computer/monitor with touch screen, the OPC series. It has been upgraded from its predecessor with better specifications, while keeping the features that has made it popular among boaters. The MPC-OPC series is designed for rugged use in semi-protected areas. It consists of an ultra low power Intel DualCore Atom mobile processor for low wattage and high performance on boats. Clear daylight viewing without glare is present through utilizing the latest LED technology. Its performance in rugged environments can be further shown by its operating temperature 0 to +50°C (-20 to 60°C with Solid State Hard Drive) making it suitable for use in almost any climate without special conditioning and a waterproof touch screen that can endure wet conditions. The IP65 anti-corrosion casing is designed for flushed-in mounting or used with a standard VESA mount. This series comes in varying sizes (12”, 15”, 17”) and can be used for electronic chart plotting, virtual instrumentation, sounder, operator interface as well as a weather computer. For a splashproof touchscreen, 2 in 1 computer/monitor version of this series which is available in the usual sizes and a 22” screen size for better viewing.